CD review: "The Swing and I"
This review first appeared in the May 5, 1995 issue of the North County Blade-Citizen (now North County Times). Eric Reed, Wynton Marsalis' longtime pianist, shows musical taste and vision on his second outing as a leader to match his prodigious playing. 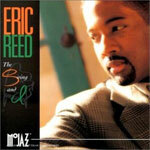 Fans familiar with Reed's work with Marsalis will be struck by how much looser this set is, how much more it swings. Reed's solos here are intuitive rather than formally structured; this spontaneity translates into an almost-live feel on what is a studio set. The original songs stand up to the covers by Ahmad Jamal and Eddie Harris. And the musicians surrounding Reed are, if not quite up to his level, still very good and able to push him.